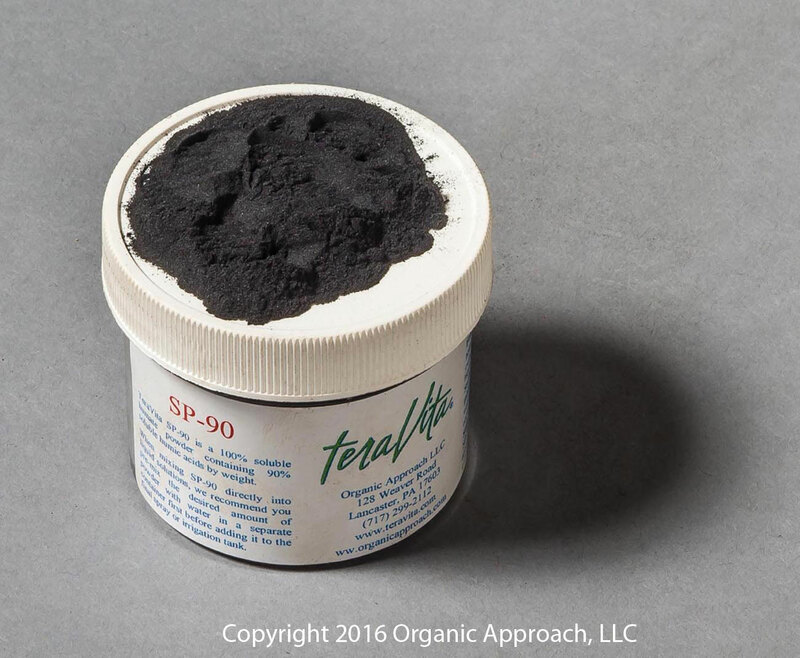 TeraVita SP-90 is a soluble humate powder (soluble salts of humic acids) that contains a minimum of 90% humic acids. Humic acids are not a plant food. Humic acids may increase the availability of micronutrients. TeraVita SP-90 is 100% water soluble. This enables the product to be applied dry or in a liquid form. TeraVita SP-90 is compatible with most companion materials, except those with a very low pH (less than 3.0). It is not compatible with calcium nitrate. To be safe, an initial jar test is always recommended when mixing TeraVita SP-90 with companion materials for the first time. TeraVita® SP-90 is potassium humate powder that acts a natural soil and plant growth stimulant. It is a dark brown to black powder with an average 90% humic acid content. TeraVita® SP-90 is 99+% soluble in water and it is easily assimilated by plants. TeraVita® SP-90 is also specially formulated using a low sodium formulation consisting primarily of Potassium Humic Acid Salts. As a result, TeraVita® SP-90 provides extra potassium for crop nutrition and minimizes sodium in growing conditions where high salt contents may already exist. Moreover, the presence of soluble Silicon (Si) compounds in SP-90 aids plants in the fortification of plant cell walls and, hence, encourages a natural resistance to natural stress situations and insects. When used in conjunction with a common-sense soil management program, TeraVita® SP-90 is a great agronomic tool to have in the toolbox. Some of its main functions include improving plant immunity, improving plant metabolism, improving plant root development, improving the supply of plant nutritional elements and increasing the formation of ferments. TeraVita® SP-90 promotes the increased accumulation of chlorophyll, sugar, amino acids and more, and improves the efficiency of nitrogen utilization, allowing for reduced fertilizer rates. One of the primary actions of TeraVita® SP-90 is to increase the plant’s ability to withstand the stresses of heat, drought, cold, disease, insect and other types of environmental or cultural pressures. TeraVita® SP-90 also increases general plant productivity, in terms of yield, as well as plant stem strength & leaf erectness. Within the soil, TeraVita® SP-90 stimulates soil microorganisms, promoting Humus formation. The bottom line is that the use of TeraVita® SP-90 should be considered when the applicator wants a soluble humate, and he/she wants to apply the humate in a liquid spray, drench, dribble, drill or soil-injection format; in most cases, TeraVita® SP-90 should NOT be considered as a material for dry applications (too dusty, too concentrated, etc.). Common uses of TeraVita® SP-90 are as follows: all types of foliar spray applications on trees, shrubs, pasture grasses, veggie crops, turf grasses, greenhouse crops, and so on; all types of drenching applications such as general watering, sod installations (even better when mixed with our Nature’s Essence soluble seaweed extract), nursery watering, tree & shrub drenching; drilling or drenching into the soil furrow or as otherwise needed in AG applications to incorporate valuable carbon and to complement (increase the efficiency of) all other AG nutrients (and even systemic herbicides, insecticides, fungicides, miticides, etc…); and soil injecting beneath shrubs & especially trees of all kinds to replace the badly needed carbon that is usually no longer present in cultivated landscape settings where leaves are not allowed to accumulate as they do on the floor of natural forest settings, to be able to complement the typical arborist application materials, and to help with soil microbial stimulation such as, but not limited to mycorrhizal colonization.